Manufactured with the same basic features as the Adjustable Height Stretcher. The Fixed Height Stretcher is manufactured to a specific table height to suit individual customer requirements. 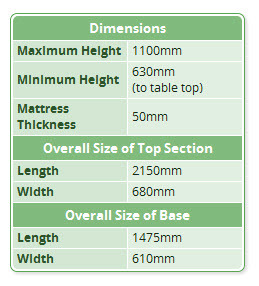 The maximum height stated is a guide. Dimensions outside of this range can be accommodated.